In 1830 a farmer plowing a field near the village of Berthouville in Normandy, France, discovered a trove of ancient Roman silver objects weighing some 55 pounds (25 kilograms). 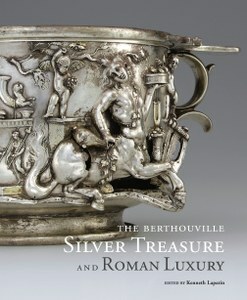 The Berthouville treasure, as the find came to be known, includes two statuettes representing the Gallo-Roman god Mercury and approximately sixty vessels—bowls, cups, pitchers, and plates, many of which bear votive inscriptions—along with dozens of smaller components and fragments. Dedicated to Mercury by various individuals, the treasure, including some of the finest ancient Roman silver to survive, fortunately escaped being melted down. It was acquired by the Cabinet des médailles et antiques of the Bibliothèque Royale (now the Département des Monnaies, médailles et antiques of the Bibliothèque nationale de France), where it was displayed until late 2010, when it was brought in its entirety to the Getty Villa together with four large, late antique silver plates, each with its own colorful history, for comprehensive conservation treatment. This sumptuously illustrated volume was published to accompany an exhibition of the same name at the Getty Villa in 2014. It presents the highlights of the treasure and other Roman luxury arts from the holdings of the Cabinet des médailles—including precious gems, jewelry, gold coins, and colored marbles—and contextualizes them in a series of elucidating essays. Kenneth Lapatin is associate curator of antiquities at the J. Paul Getty Museum.